“Um… I think you may have ordered too many dishes,” our waitress said tentatively after we placed our order. I wonder what gave her that idea? :P We assured her we were very hungry and were happy to stick with what we’d ordered. Oh, so much food! But not too much food! Last Friday, Jac and I met up with my sister Juji and her fiancé Jay for dinner at Old Cathay in Victoria Park. It’s a relatively new Chinese Malaysian restaurant that opened for business in April this year. It’s nowhere near the main cafe strip in Victoria Park – instead, it’s tucked away on the ground floor of the Monadelphous building, where Albany Highway meets Shepperton Road, just before you cross the bridge heading towards Perth. Many people have probably driven right past it but never realised there’s a restaurant there (well – actually, a couple of restaurants). Delicious smells tormented us from the moment we walked in, making us feel even more ravenous. We ordered a number of dishes to go with steamed jasmine rice (AU$2 per person) and then waited impatiently, trying not to stare too obviously and enviously at the plates of chilli pepper soft shell crab and stir fried noodles being delivered to the table next to ours. 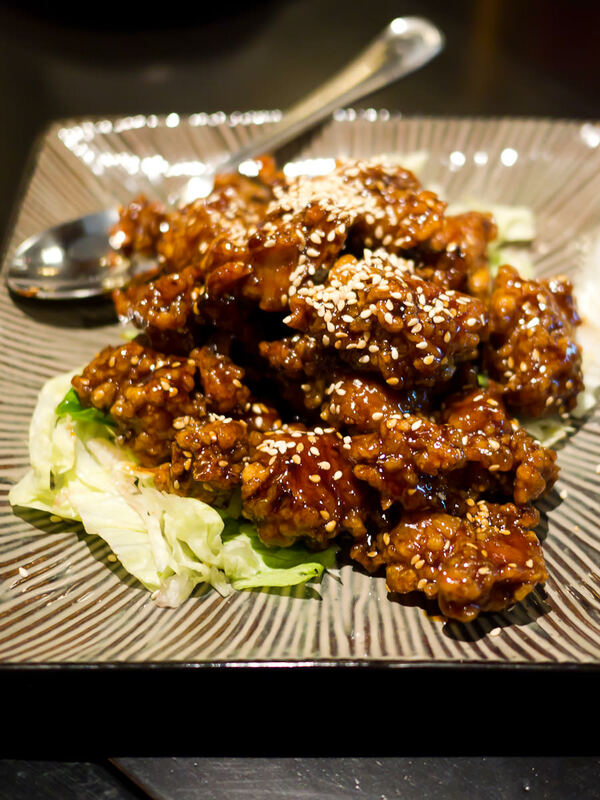 The first of our dishes to arrive was the Marmite chicken (AU$15.80), boneless battered chicken pieces smothered in a sticky dark Marmite sauce. It’s quite a salty dish, thanks to the Marmite. Most of the dishes we ordered, including this one, came with a sauce or gravy perfect for the rice to soak up. 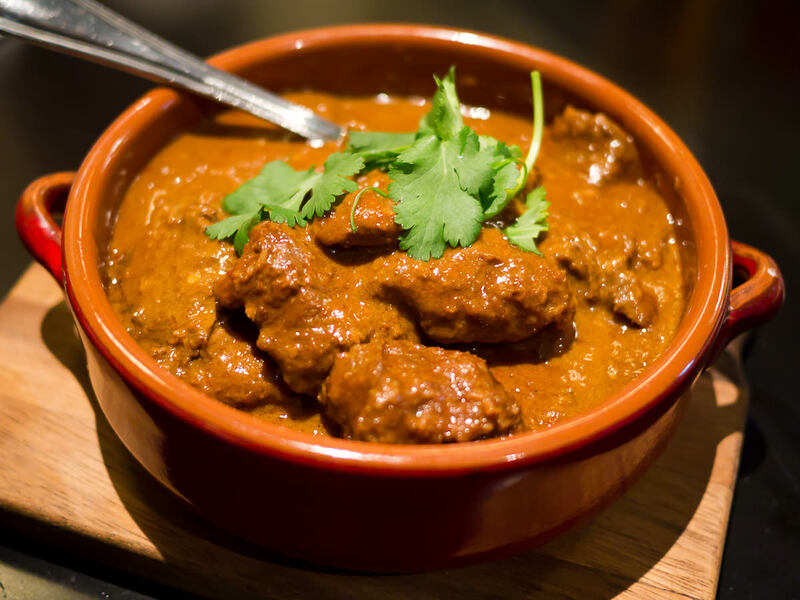 The Malaysian beef rendang (AU$17.80) was very tasty, the beef pieces unbelievably tender. The only ingredient missing for the authentic rendang taste was toasted shredded coconut. 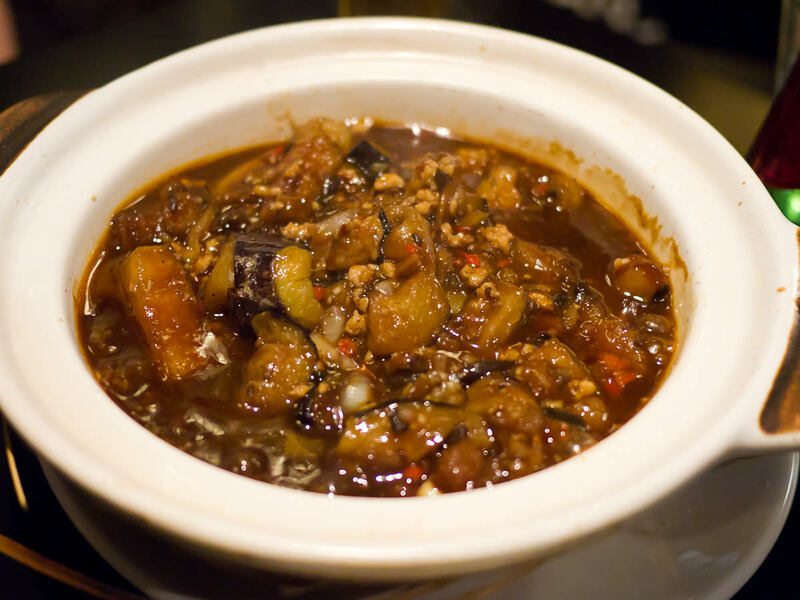 The eggplant, pork and salted fish claypot (AU$15.80) was served spitting and bubbling like a witch’s cauldron. I dug in eagerly and almost immediately burned my mouth on a piece of piping hot soft, slippery eggplant. In the dish was pork mince, red chillies and little morsels of salted fish. A very home-style, fiery flavoursome dish. 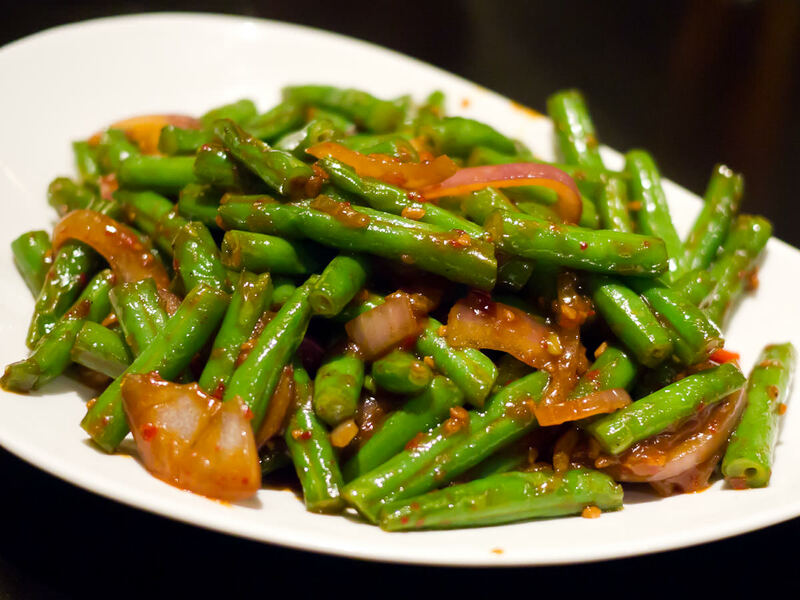 We also ordered stir-fried long beans with sambal (AU$14.80). The beans weren’t really long beans (also called snake beans) – they were run-of-the-mill green beans – but they were deliciously toothsome and we couldn’t stop eating them. The beans were stir-fried with sliced onions and a very Malaysian condiment – sambal belacan, made with chillies and fermented shrimp paste known as belacan (pronounced ber-lah-chan). Belacan is notoriously pungent – once smelled, never forgotten – when we were kids we described it as “stinko”. I hated the smell when my grandma cooked with sambal belacan. She’d make her own sambal belacan, pounding fresh chillies, shallots and shrimp paste with a mortar and pestle, and then fry the resulting mixture in the wok with fish or vegetables. The spicy stinging aroma filled the house and would hang around for ages even with all the windows open. I’ve recently surprised myself with the realisation that I’ve grown to like “stinko” sambal belacan. Old Cathay’s assam king prawns can be ordered with or without shells, and in two sizes – medium (AU$28.80) or large (AU$35.80). We ordered the medium serving without shells but were served prawns with shells. We didn’t really care that much so didn’t bother sending the prawns back – we just ate them. 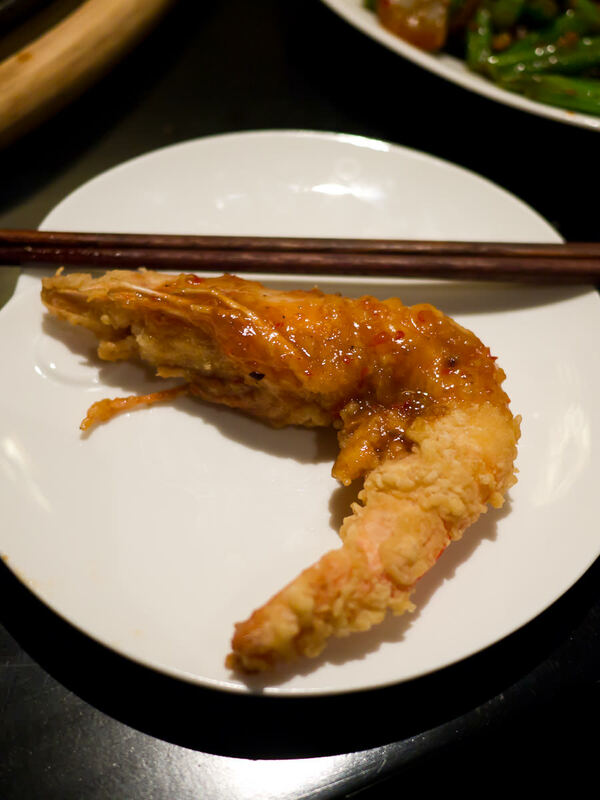 The ginormous meaty prawns were battered and deep-fried and served in a hot and sour assam (tamarind) sauce. Juji and Jay especially enjoyed munching on the prawn heads. It was a fantastic feast. But believe it or not, we were still missing one dish! Jay checked with a waiter and was assured it was on its way. 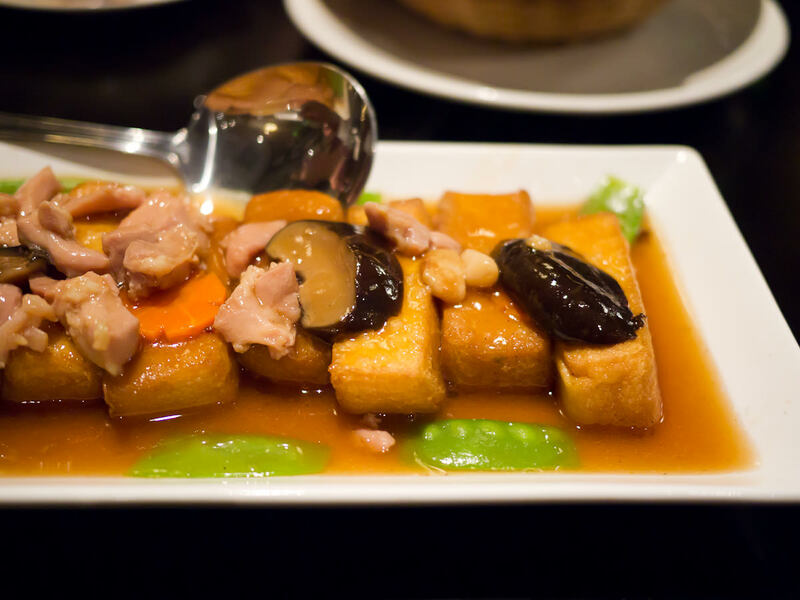 The missing dish was Old Cathay Gui Fei tofu (AU$16.80), described on the menu as homemade tofu with shredded chicken, mushroom and carrots. 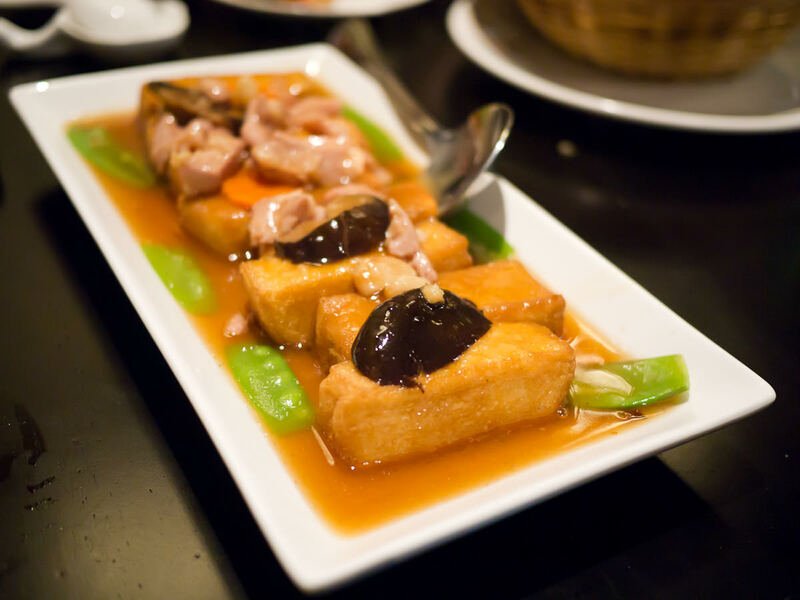 This proved to be well worth the wait – the standout dish of the evening that made me think of Chinese New Year. The shiny black Chinese mushrooms were juicy and had absorbed the aroma and flavour of sesame oil. 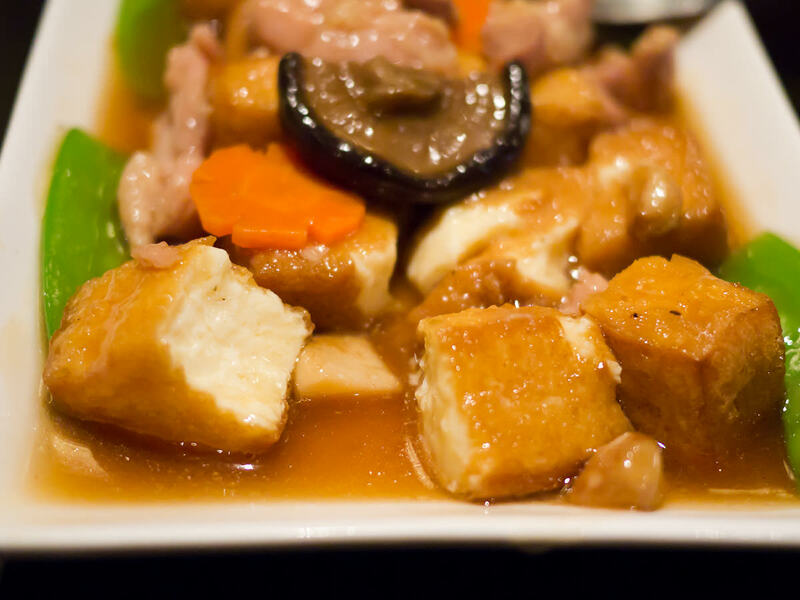 The homemade tofu was beautifully soft and silky, the chicken pieces tender. So hands up if you seem to have separate sweet and savoury stomachs! Our savoury stomachs were very full by this time but our sweet stomachs were ready for dessert. 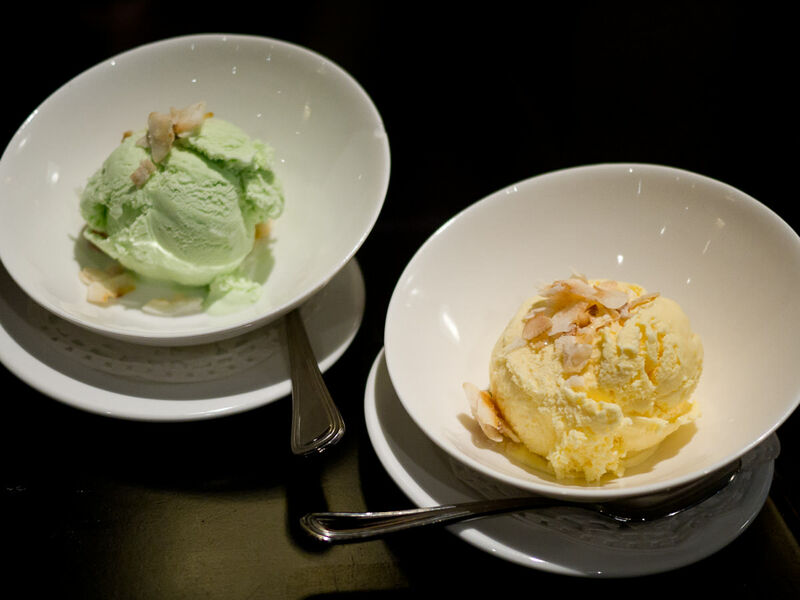 Old Cathay’s desserts revolve mostly around ice cream, of which there are four flavours: pandan, taro, jackfruit and coconut. Jac ordered the mango pudding with a scoop of coconut ice cream (AU$8.80). The pudding was bursting with mango flavour but had been made with way too much gelatin. It should’ve been soft like panna cotta but felt more like a bouncy rubber ball. 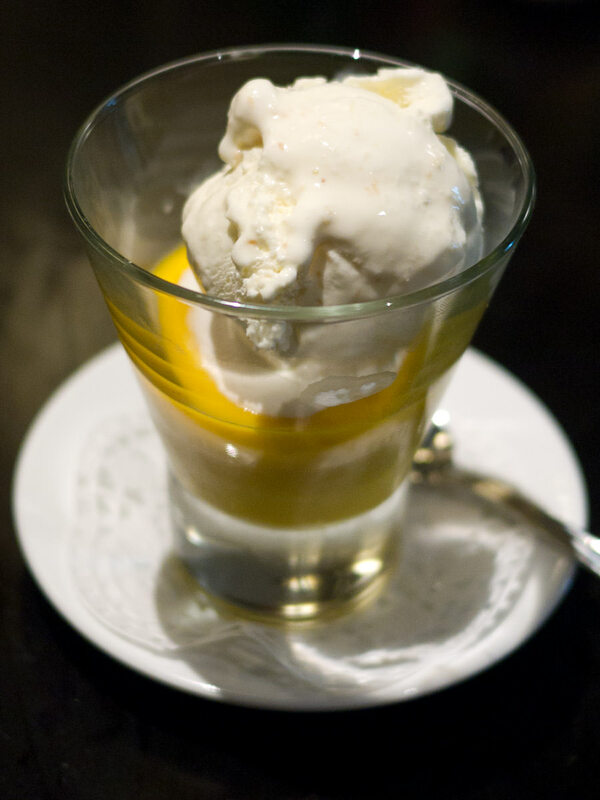 Jay ordered a classic Malaysian dessert – sago gula melaka, with jackfruit ice cream (AU$6.80). The tender sago pearls were served in creamy coconut cream and gula melaka (palm sugar syrup). I could tell Jac was quietly grappling with an acute case of dish envy! 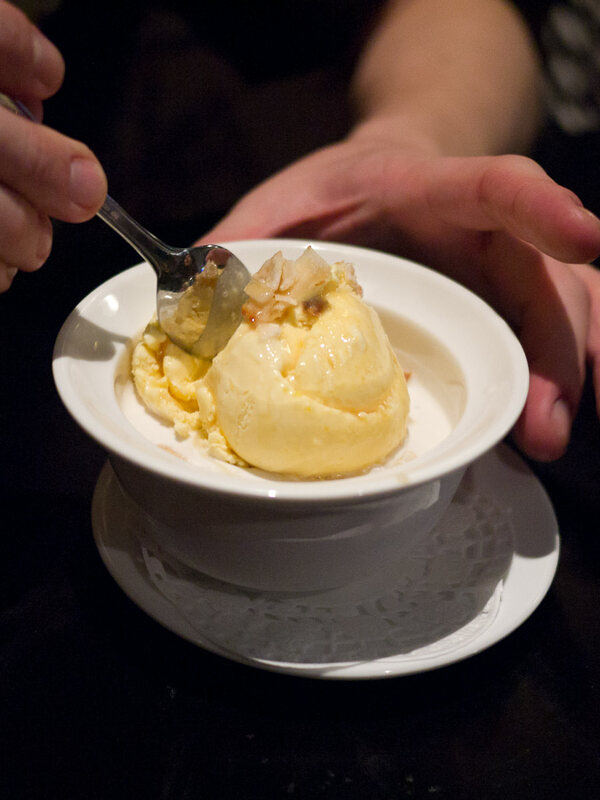 Juji and I each ordered a scoop of ice cream (AU$4.50 per scoop), served garnished with candied coconut. 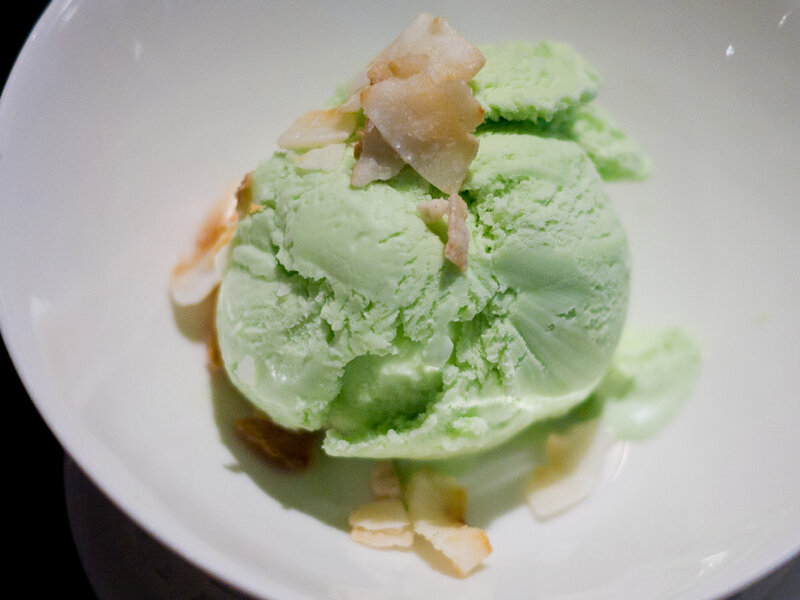 Juji’s pandan ice cream looked promisingly green but tasted disappointingly like vanilla. The distinct pandan fragrance/flavour simply was not there. My jackfruit ice cream was a winner. 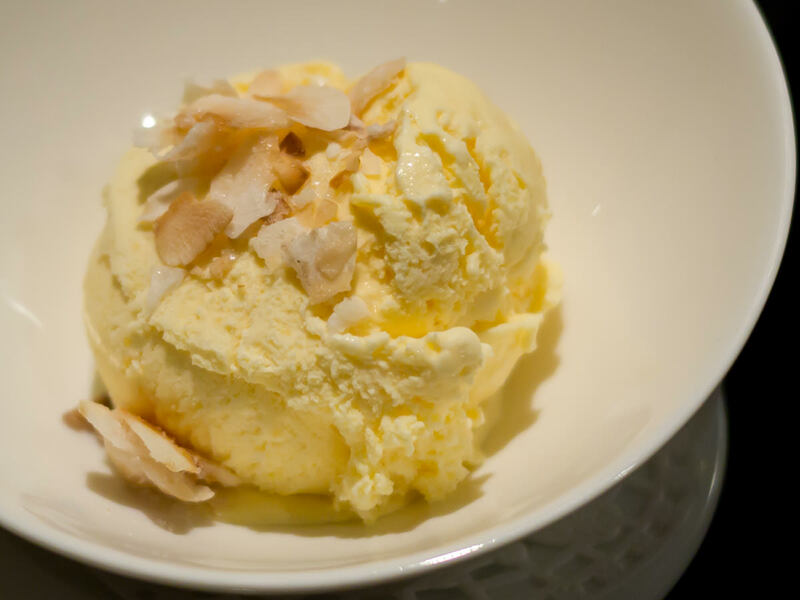 It was the colour of whipped butter and delightfully creamy, with tiny specks of jackfruit in it. Our waiter told us the ice cream is specially made for the restaurant and comes from Sydney. I told her that I loved the jackfruit but they should really consider getting durian ice cream. That would be divine! 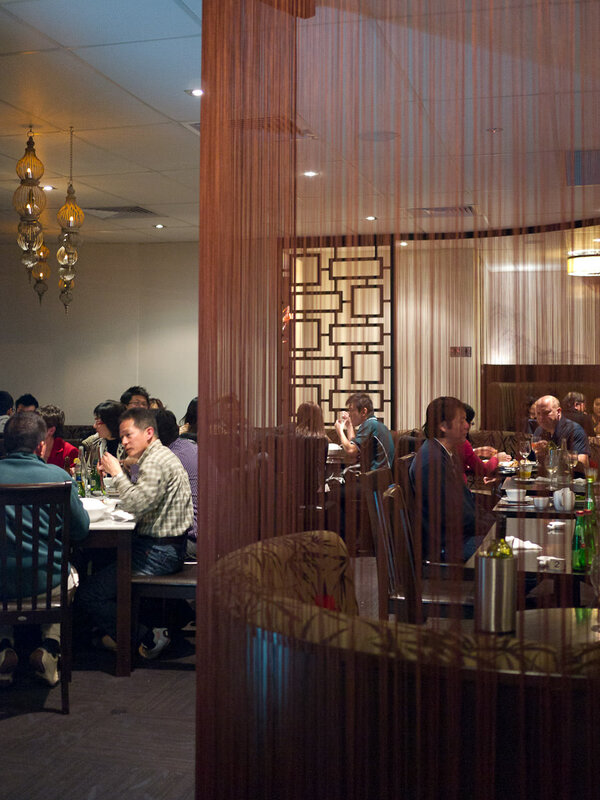 The restaurant features booth-style seating and manages to avoid the sparse office look of so many Asian restaurants. The service was very good. It was very busy on the Friday night we were there – I’d definitely recommend making a booking. According to Old Cathay’s Facebook page, their “culinary team” comes from Malaysia, specifically Melaka, Penang, Kuala Lumpur and Johor Bahru. We really enjoyed our dinner and hope to return soon. 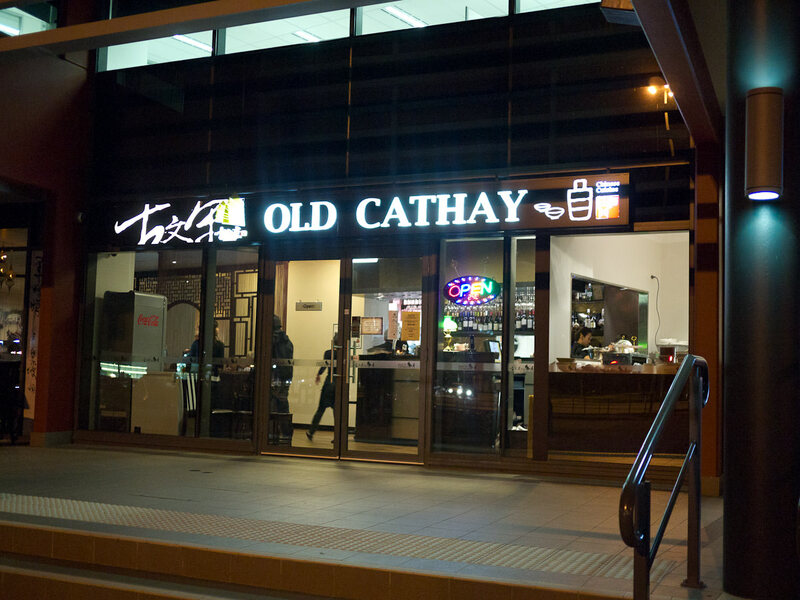 We’re keen to try lunch at Old Cathay – they serve hawker style dishes including Hainanese chicken rice, nasi lemak with curry chicken or beef rendang, roast pork or BBQ pork with rice, Penang fried kway teow and BBQ pork wantan noodles. Prices at dinner time are more expensive than the average Malaysian restaurant, but their lunch time meals are around the AU$12 mark. TFP dined at Old Cathay with compliments of Malaysia Kitchen. All opinions are my own. EDIT, 1 September – RESULTS: Thank you so much to everyone who voted and helped spread the word! The results are out and it’s official! I’m going to Malaysia! This was my second post for the Malaysia Kitchen Blogger Summit. I had a wonderful time eating and photographing dishes at four of Perth’s Malaysian restaurants. I hope my posts captured at least some of the diversity, complexity and deliciousness of Malaysian cuisine. 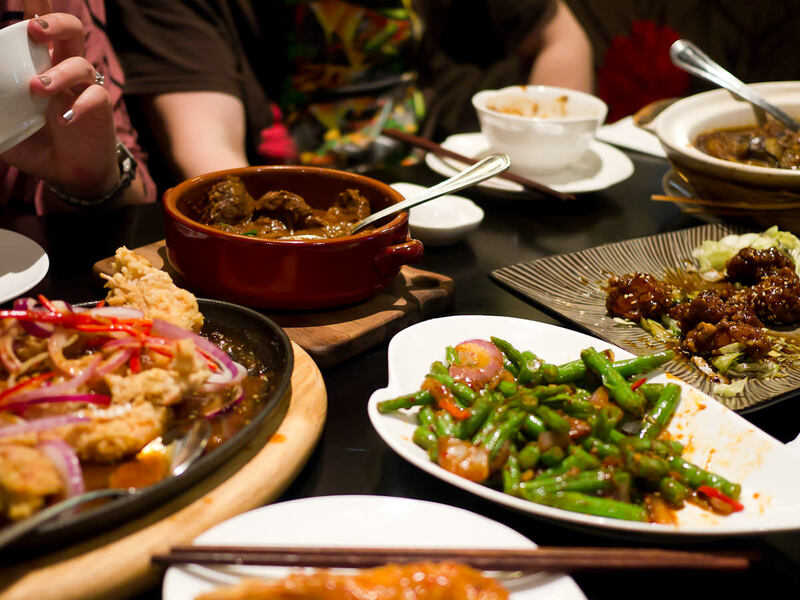 Thirteen bloggers across Australia reviewed local Malaysian restaurants throughout August for a chance to win an all-expenses paid trip to Malaysia for the ultimate food lovers’ adventure. At the end of August, the three bloggers with the most reader votes across all their posts were announced as the the winners. Below are the posts I published as part of the Malaysia Kitchen Blogger Summit Competition. 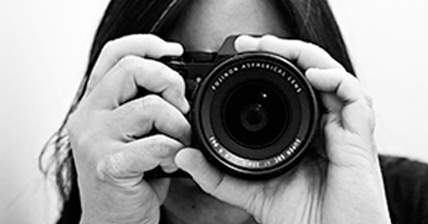 They were published on the Malaysia Kitchen (MK) site as well as here at The Food Pornographer. Thank you once again to everyone who voted for me and helped spread the word! 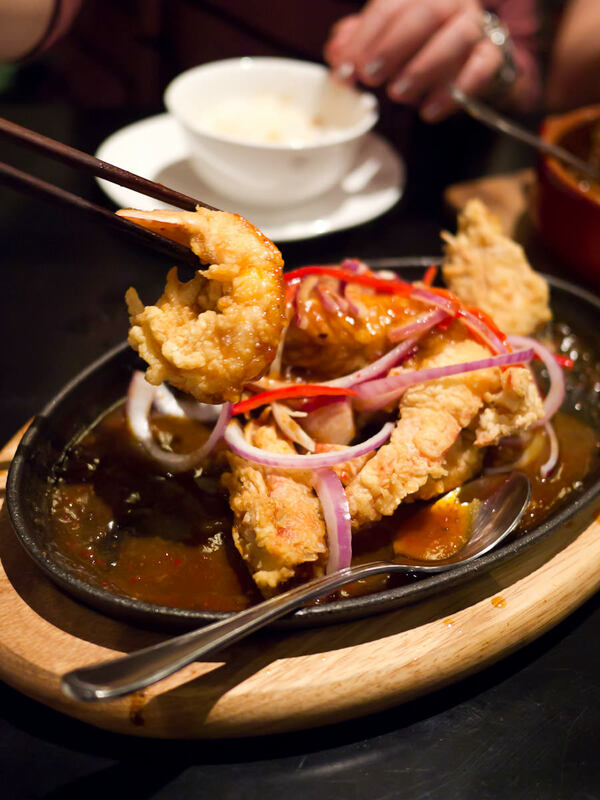 A Malaysian eating adventure awaits… stay tuned!